Organizations are optimizing their operations with decision modeling, creating a streamlined and more agile business. Leading organizations are adopting decision modeling with the Decision Model and Notation (DMN) standard to improve operational efficiency, agility and business-IT alignment. Decision modeling gives enterprise architects and business process analysts a standard way of graphically representing precise business meaning that is easy for the business to understand and doesn’t require code. Organizations can’t respond more quickly to new opportunities, new regulations or new challenges than their business processes and enterprise applications will allow. Decisions are the highest change components of a business, but are shoehorned into business processes or buried in application code. With decision modeling, the relevant operational decisions that drive business results are modeled alongside business processes. Decision modeling is complementary to business process modeling, and DMN is a peer standard of BPMN. Business process modeling with BPMN is not required to achieve significant benefits with decision modeling. Many organizations are adopting decision modeling as a much simpler and easy to use approach. Organizations looking to increase decision automation for digital processes take the next step and replace decision logic hard-coded within business applications or buried in business processes with independent Decision Services using a business rules management system (BRMS), and embed predictive analytics functions such as scoring results to improve these decisions. 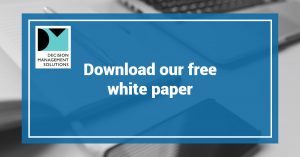 Register to download our white paper to learn more.